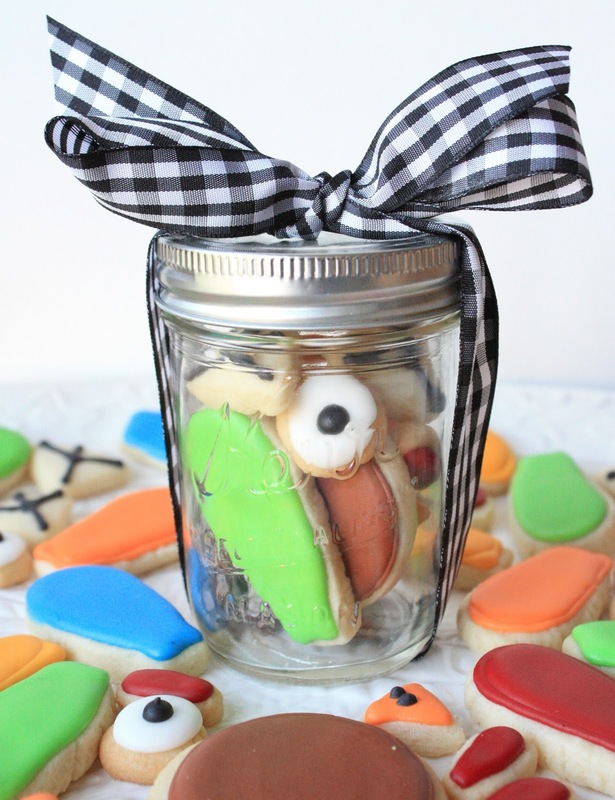 Did you happen to see the darling, inventive Jack o' Lantern cookie in a Jar from Bee in our Bonnet? Well I did, and I was instantly smitten!﻿ I decided on the spot to make a Thanksgiving version for the munchkins, a colorful little turkey. I had cutters on hand for the circles (body, eyes) and the triangles (beak, feet) but made a simple template for the basic turkey feather shape and the teeny wattle. I traced my template onto﻿ a file folder, cut it out, placed it on the cookie dough (my favorite sugar cookie recipe) and cut around it with a small knife. While the cookies were baking, I made up a batch of royal icing, and mixed gel paste food coloring for all of the different colors. After the cookies were completely dry, I divided all the turkey parts up and put one complete turkey in each half pint jar. How fun and easy is that? I think the munchkins will have a good time playing with their turkeys before they eat them. aw, those are so cute! What a fun idea for the kiddos. I can see that this would be such a cute idea for a favor for the children's table. 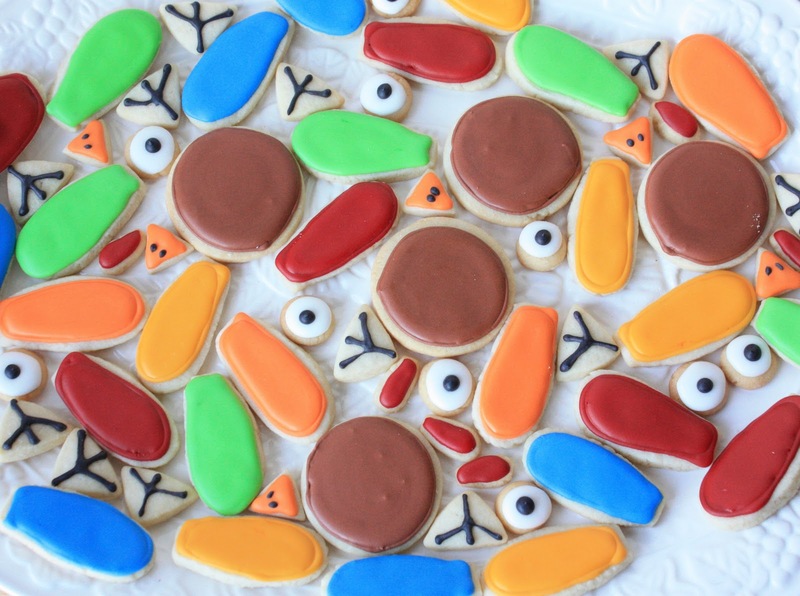 Your Munchkins are going to have a grand time with these. I'm keeping this one in mind just in case I ever get some Munchkins. This is the cutest thing I've ever seen. Period! Oh those are darling! What a riot!!! That's hysterical. Love the resulting expression on the turkey after it's assembled. Sue, these are priceless!!! LOVE them!!! OK this has to be the NEATEST idea for thanksgiving using a TURKEY as I can think. I can't say it enough....LOVE IT!! I wish I had time to do this..I WISH I WISH I WISH!!!!! Darn work and test! Oh my goodness this is just sooo funny and cute. Just perfect for munchkins and big people alike:) I love the big eye peering out. How cute, I'll have a leg please. I hope to get your little prize to you next week, little behind with work right now, no time for special cookies yet. Too cute! Love that you get to assemble the separate pieces -- what a fun surprise! Adorable, hilarious, has it all! Gotta post tomorrow on edible crafts. Gotta. Oh my, this is so cute! 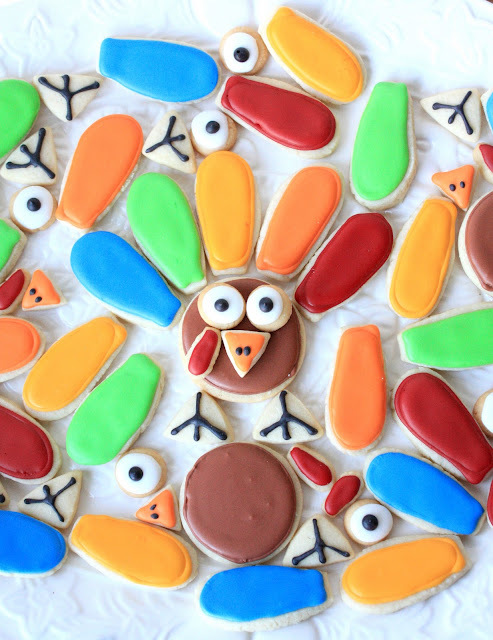 How much fun as a kid to get a jar full of cookies and get to put the turkey together? So much fun!! Wish you and your family a wonderful and blessed Thanksgiving! Oh my goodness, these are too cute! What a great idea for kids! This is so sweet!! My boys would love it. Love this idea so much! I found you via Pinterest!! I hope you don't mind, but I am sharing this with my FB fans! Such a cool idea! So cute! I LOVE THIS! Turkey parts in a jar is genius and so cute! The best part is finding all the right parts to form the whole turkey cookie! I know I say this all the time, but you are SO amazingly creative! LOVE! They turned out so cute! I'm not sure I could've made the turkey so cute! Let the jars live on! Christmas one's are in the works. I'm so happy to discover your fabulous blog! Following along now! Those are ADORABLE! Great idea. il me semble que cela ferait mieux English fathers, ce serait mieux, non ? So cute and so fun to construct for the family! ^^ Your desserts are absolutely beautiful! This is the cutest idea! I love his little face when he gets all put together! I bet the kids will have soooooo much fun with this one. Have a wonderful Thanksgiving Sue. Back to say happy thanksgiving to a gal with a super blog that I enjoy very very much. This is by far the cutest thing I have seen all thanksgiving! So cool! Fun, easy and adorable! Hope you had a great Thanksgiving. This is one of those times I am SOOOOOOOOOO sad I didn't have god Internet at moms!!! I am bummed I missed these! BECAUSE I LOVE THEM!!! I am so incredibly late in seeing this, but WOW! How stinkin cute is that idea! LOVE LOVE LOVE this! I wish I had seen it before Thanksgiving. Super adorable! Love your posts always Sue! Thanks for sharing! Love it! and great idea, sue! Oh how I love this idea! So fun and creative. I am totally doing this next year! I wonder if I could figure out a holiday one to do now.... maybe a Santa or a tree? Love this idea! In LOVE with this idea!!! These little guys are SOOOOOO cute!!! These are amazing. I want to make them but I'm nervous about the hand cutting of the sugar cookie dough! What kind of time commitment do they take to make? Kelly, Of course it depends on how many you want to make, but for a few, it should really not take too long. I made eight, which was forty feathers and I think it took 15-20 minutes to cut them out. Make sure your dough is chilled so that it is easier(more firm) to cut once you roll it out. Have fun!